Margaret LaRae Goates Jarrett returned to her Heavenly Father on August 2, 2018 in Delta, Utah. LaRae was born on October 29, 1923 to David Ray and Cathrine Virl Clark Goates in Lehi, Utah. She married her eternal companion, Dee Olpin Jarrett, on June 14, 1946 in the Manti, LDS Temple. LaRae was a dedicated and loving wife, mother, and grandmother. 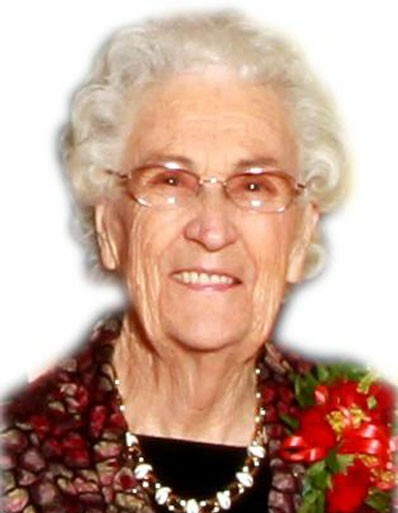 She was also a faithful member of the Church of Jesus Christ of Latter-day Saints serving as a chorister and choir director; teacher in Sunday School, Primary, Mutual, and Relief Society; and counselor in four Relief Society Presidencies. Dee and LaRae served as missionaries in their stake as well as in the Minnesota, Minneapolis Mission. She was a devoted temple patron right up to the end. LaRae was preceded in death by her husband; her son, Norman; her grandson, Cody; and three great-grandsons, Austin, Kasen, and Landon. She is survived by her children, Dale (Mary), Alvin (Mary), DeAnn (Morris) Burton, Carolyn (Russ) Wilks, and Phyllis (Clyde) Ellertson; twenty-seven grandchildren; seventy-two great-grandchildren; and 1 great-great-grandchild. Funeral services will be held on Tuesday, August 7, 2018 at 11:00 a.m. at the Nephi Utah Stake Center, 351 North 100 West in Nephi, Utah. Family and friends may call Monday, August 6 from 6:00-8:00 p.m. at Anderson Funeral Home at 94 West 300 North in Nephi, Utah, and Tuesday one hour prior to the service. Interment will be at the Vine Bluff Cemetery.